This morning on the scale, I weighed 158! Yippeeee! Author debbie @ That's Just MePosted on March 31, 2010 Categories Weigh inTags healthy, Weigh inLeave a comment on 158 – Yeah Baby! Back up to 159.6, not that it’s bad, I just wanted to make an official note! I love sweet potatoes, or are these yams!? I will have to look at my Whole Foods recipe. Anyway, I don’t make them often enough because my DH supposedly hates them, but I just don’t see how! They are sweet as sugar! Delish and so good fir you! Hey now! More more more! Is the scale messing with me, or am on on a big losing streak! Yay. 158.8 pounds! That’s 41.2 pounds down! Author debbie @ That's Just MePosted on March 25, 2010 Categories Weigh inTags healthy, Weigh inLeave a comment on 158.8 – yay! I finished watching (Fine Living Network) FLN’s rebroadcast of season 7 of the Biggest Loser. It’s been on every weekday morning at 8am and I have a ritual with my two doggies, to stay in bed, have a little breakfast, play on the computer, and watch the Biggest Loser before I head to work. I didn’t become a regular Biggest Loser fan until season 8, so it’s been fantastic to catch up with older seasons. After watching season 5 with Allie Vincent winning, I was excited to view season 6, with Vickie, the game playing manipulator I heard so much about. But unfortunately, they skipped season 6, and started playing season 7, which was okay. So now they are repeating season 8. Wow, I watched the original shows, but it was really great to see them at the “beginning” again to realize how far the contestants have come! Especially Shay Sorrells – she is such an inspiration. I follow her on Facebook, & I think she’s just great! I also adore Amanda and Rebecca. I don’t know why, but I find such inspiration in the Biggest Loser contestants. I know there are a lot of people who disapprove of the show and their weight loss tactics, but peel away all the “Made For TV” crap, and you’ll find human beings finding a new way of life for themselves. I find motivation in their daily struggles! I can relate to their pain and determination. Now that I am so close to finishing my weight loss journey, I need to keep finding new inspirations to maintain all I have accomplished. And the Biggest Loser helps! And yay, a new episode is on tonight! Oh yum. I was at Whole Foods grocery yesterday (my favorite place to be) and the produce guy, Jason, was very helpful. I was asking him a few questions about the apples on sale, and when organic peaches, plums, nectarines arrive, and after he saw me choosing a few navel oranges, he came over to me and offered me two (free) Heirloom Navel oranges to take home. It was very nice. The oranges were soo cute with the leaves attached. I am such a sucka for fruit with leaves attached! Anyway, I just had one now. Jason said they were very sweet, and he was correct! Oh it was yummy! Very easy to peel and it was so sweet. The label said they were from a company called www.ripetoyou.com so of course I had to look them up. The company is from California (of course, they do grow the BEST and ONLY navel oranges I will eat) and it sounds like they are a wonderful caring company. I am always bummed because the California Navel orange availability is always so fleeting. It looks like I only have a couple more weeks for my favorite Cara Cara, but the Heirloom Navel will still be available until the beginning of May. It was helpful to view their online Variety Chart to see when fruits were in season. Anyway, I love Whole Foods! Jason also helped me find a pineapple on sale! Oh and unfortunately, organic peaches, plums, nectarines, etc won’t be available until summer, end of June or early July. Yum, I love eating in season! So much to appreciate and look forward to! 159.6 I’m in the 150’s! Yeah! Weighed myself this AM and lookie lookie, i’m now in the 150’s! 159.6 pounds! Yay! Author debbie @ That's Just MePosted on March 22, 2010 June 12, 2010 Categories Weigh inTags healthy, Weigh inLeave a comment on 159.6 I’m in the 150’s! Whaah!? This is wonderful and strange all at once! I know I said that I shouldn’t weigh in until this weekend but I couldn’t resist. So the scale read 160.2! And I jumped on the Wii Fit Scale and it was very close at 160.7! So either way I am less than a pound away from my original goal of 160! My new goal is 155 or 150 maybe. We’ll see how my body reacts. I will be happy with 40 pounds!! Author debbie @ That's Just MePosted on March 18, 2010 Categories Weigh inTags Weigh inLeave a comment on 160.2 on the scale! Well, I am getting better at this bread thang, but still not perfect. 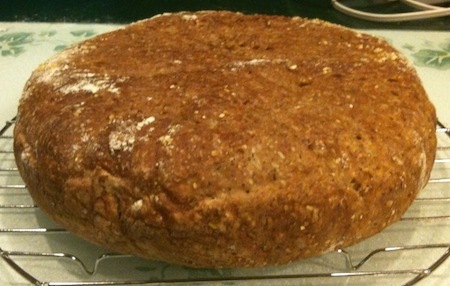 I followed the same whole grain no-knead recipe from before. Instead of wheat germ, I decided that corn meal might be a nice addition! And I did buy some vital wheat gluten. It all went very well, until the towel. After the dough rested for 22 hours or so, I didn’t have too much trouble folding it, and I even flipped it, and tucked it under. I transferred to the floured towel, and wrapped it up for a couple of hours more. So, after the 2 hour rest in the towel, I unwrapped and tried to flop it into the preheated (4 qt) cast iron pot. When I flipped it upside down, it just hung there, and slowly fell, pulling and stretching the dough all the way down into the pot! I was so bummed. I can’t seem to get the dough not to stick to the towel no matter how much flour I use. sigh. So, no more towels! I am going to just use parchment paper, and plop that into the pot! 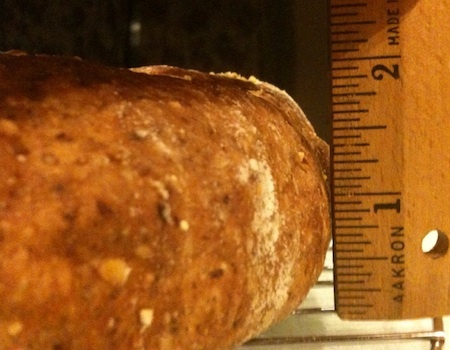 As you can see from the photo below, I don’t think it lifted quite high enough in the oven. So, it looks like a cake! So what! It’s bread cake! Oh but I did buy a cheap oven thermometer to check my oven temp, and it registered at 350° so that is good! So, after it cools for a little bit longer, I will slice it and hopefully it won’t be too dense.